Reference number for this case: 18-sep-54-Lodeve. Thank you for including this reference number in any correspondence with me regarding this case. 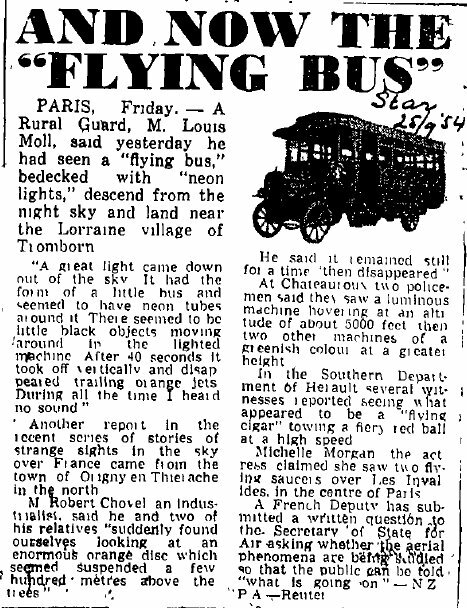 Reported in the Puy-de-Dôme, the Allier, in Lorrain[e] and in the sky of Rome, the mysterious craft were also observed in the Hérault, Saturday, at 7 p.m., by three Lodève residents. On returning of a patrol during the night of Tuesday to Wednesday, two gendarmes of Chateauroux, Mr. Coutaud and Mr. Peninon, stated to their chief that they have seen, between 09:15 P.M. and 09:45 P.M., above Fleuranderie, village of Montierchaume (Indre), a luminous machine hovering still in the sky, at a height of approximately 1500 meters of altitude, then two others of greenish color at a greater altitude. The three mysterious objects, after having turned at a 90 degrees angle, are said to have taken the noth/west to south/east direction. 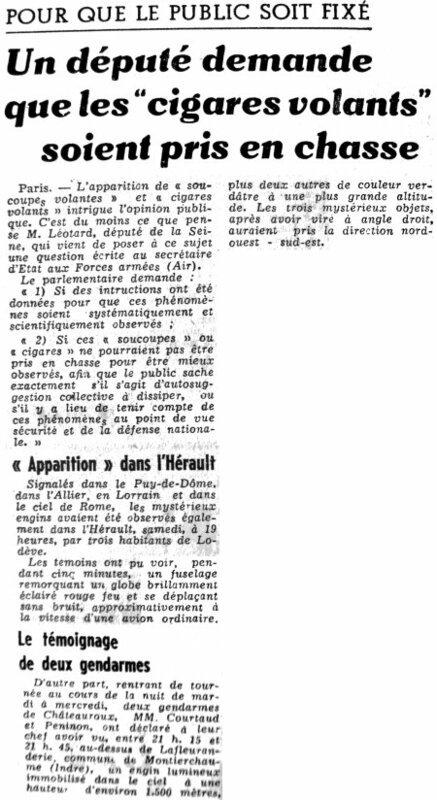 Aimé Michel indicates that on September 18, 1954 there was an observation of a flying object disappearing in the south at 07:00 p.m. by three people in Lodève in the department of the Hérault. On September 18, three witnesses see a U.F.O. passing above the city of Lodève. 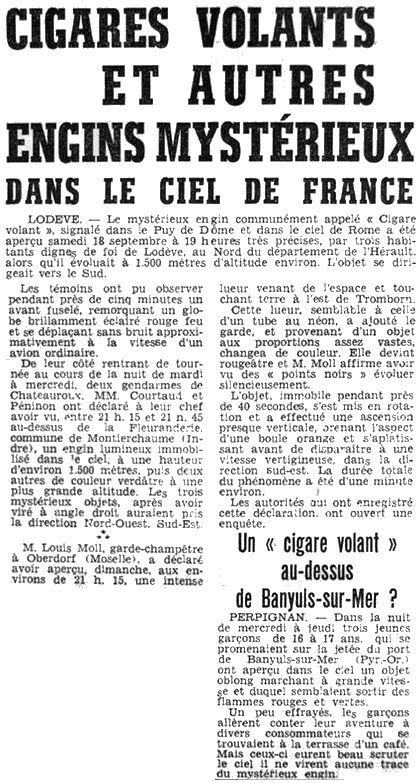 Luc Chastan indicates in his database that in the Herault in Lodève on September 18, 1954 at 19:00 hours, "Three inhabitants observed a cigar, as it moved at 1500 meters of altitude approximately. The object moved towards the south. The witnesses could observe during nearly five minutes a thinned front, towing a red fire sphere, strongly lighted and moving without noise, roughly at the speed of an ordinary plane." The source is indicated to be my website at "http://ufologie.net" - actually the old address of its home page. 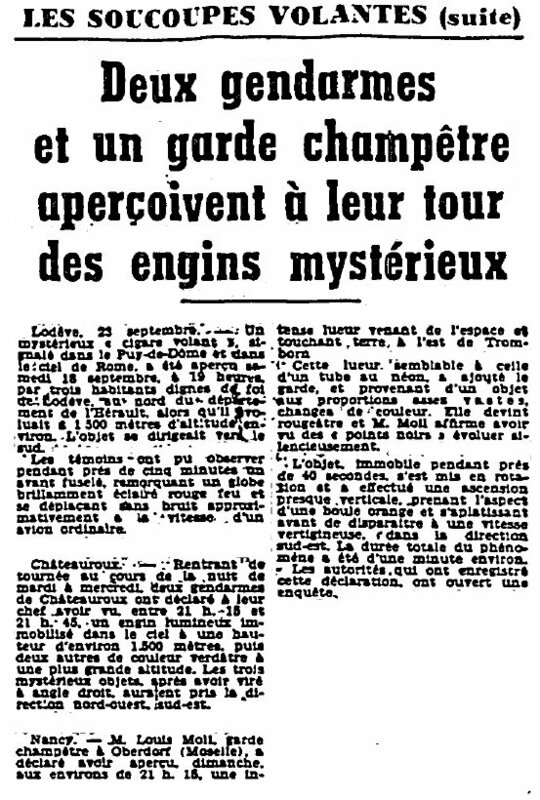 The website indicates that on 18 September 1954 at 19:00 in Lodeve, France, "An unidentified object was sighted, but with appearance and behavior that most likely would have a conventional explanation. One object was observed by three witnesses for five minutes." [tg1] "1954-2004 : de la grande vague à la commémoration", article by Thierry Gaulin in the UFOmania ufology magazine, Didier Gomez publisher, France, #41, page 26, Fall 2004. 1.2 Patrick Gross October 23, 2011 Addition [in1]. 1.4 Patrick Gross January 18, 2017 Addition [br1].